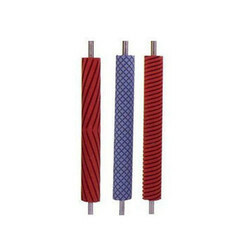 We are a leading Manufacturer of spiral and straight groove rollers from Ahmedabad, India. Anar rub tech pvt ltd provide Nitrile Rubber Neoprene Rubber Hypolone Rubber Silicone Rubber Ebonite that have modular design and can be availed by the clients in numerous standard versions to satisfy variegated loads on applications. In this component, the spirals go up or down and can also be made reversible. Features like ease of installation, dimensional accuracy and long service life make this product a favorite of numerous clients.